Shine Bright with Your Perfect Smile! Get a FREE Initial Consultation Quote for Veneers. No Obligation. If you have minor smile imperfections porcelain veneers might be the solution. Veneers work in a similar way to false fingernails in that they cover up the face of the underlying tooth. The veneers are generally between 0.3mm and 0.5mm thick and are cemented to the surface of the tooth. Porcelain veneers have the advantage of having a beautiful natural shine, strength and durability. They are ideal for transforming smiles. Improving the colour and shape of teeth. Closing spaces (gaps) between teeth. Concealing broken or chipped teeth. Concealing crooked or misshaped uneven teeth. Porcelain Veneers are thin porcelain material placed on the front of teeth to improve the appearance and colour of teeth. They are best used in cases where the patient’s teeth are; Chipped, broken, heavily filled, stained and discoloured. 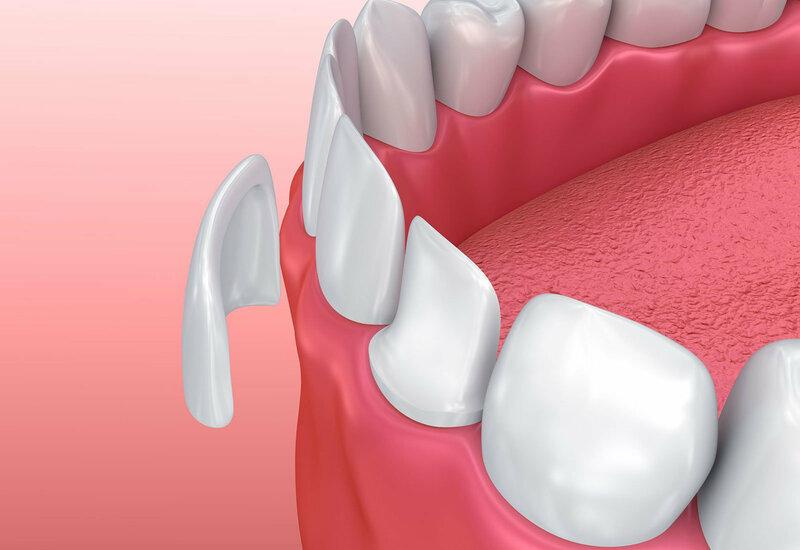 Treatment can also be used for situations when the front teeth are short, crowded or in the wrong position. Our cosmetic dentist can either shave a thin layer of tooth or may be conservative and not remove your structure. They will take an impression and glue in temporary veneers. The patient will return to get a final fitting of the veneers. At Amazing Smiles porcelain veneers cost around $1,100 each and carry 4 year guarantee against chipping. Please note, as your teeth are unique to you, prices vary between patients and if applicable is also subject to private health provider. Multiple teeth packages are available at a discounted rate per tooth. Composite Veneers are similar to porcelain veneers. They are an economical option of improving the patient’s smile and are more popular due to their affordability. Composite teeth veneers are made of dental composites which are molded and manipulated to size on the day. They are then trimmed and polished to simulate the shape and colour of real natural teeth. The dentist will spend considerable time talking and discussing with patient details like colour, shape and overall expectations. Composite veneers average around $320 per tooth. Please note, as your teeth are unique to you, prices vary between patients and if applicable is also subject to private health provider. Multiple teeth packages are available at a discounted rate per tooth. Like Crowns and Bridges, it is reasonable to expect veneers to last ten to fifteen years or more. Occasionally veneers come lose or fall out. To protect your veneers you need to maintain good oral hygiene. Healthy teeth and gums require brushing twice daily with fluoride toothpaste and flossing once a day. Regular professional cleaning by your Dentist or Oral Health Therapist is essential. Failure to adequately maintain your veneers puts them at risk. Does my Private Health help with Veneer Costs? Patients who have Private Health Fund with major dental cover will have cover for porcelain veneer/s. Please contact one of our clinics closest to you for details on how your private health fund may help with your veneer cost. Your private health fund provider may have different policies and covers in place for veneers.